Khloe Kardashian has been in the spotlight lately, with of course the launch of her book ‘Strong looks better naked’, her new fitness regime and of course her new body. She nonetheless is now looking really hot and sort of taking the limelight away from the other sisters a little bit. ​Though Kim being the most famous in the recent past, things have changed a bit. In my opinion Kylie, Kendell and Khloe have taken center stage for a little bit. 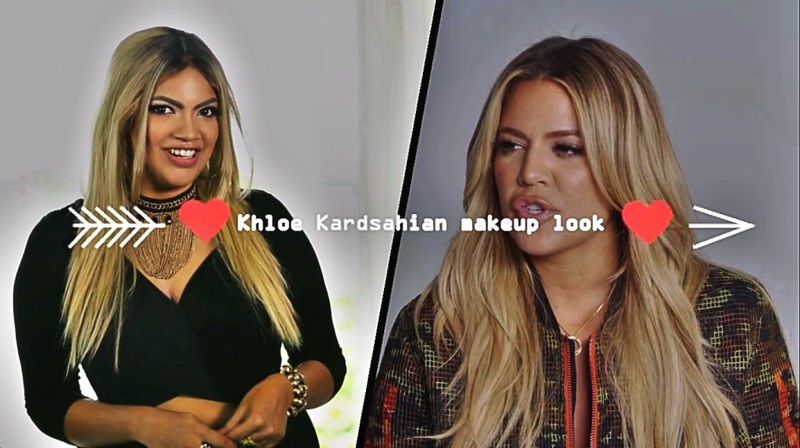 Khloe has never looked better and I think if I was to try and attempt a celebrity inspired makeup look, Khloe maybe my closest bet. Because we are both not a size zero! And we have similar hair colour and style. Well, today I’ve tried to re-create a wearable Khloe Kardashian look that maybe you too can try and achieve. Hope you enjoy this video and please give it a thumbs up if you like it. And of course please subscribe below if you haven’t already. I release one video per week, and more exciting things coming in the future. This video was a collaboration with another YouTube who happens to be a very good friend of mine. She and I both have YouTube channels on beauty and makeup. Please go over to ‘That’s so Charming’ and check out her channel as well. She has re-created a Kylie Jenner makeup look for you. She is based in Fargo, North Dakota USA and does some cool videos and I’m so glad that we did this collaboration together!